Oh! How I adore a good food book. It’s easier for me to be pleased with cookbooks and food books. They are real comforts for me. I started reading this book on my Kindle in 2012. I liked the first couple of chapters so much that I was able to score a cheap copy off Book Outlet. Then I put thoughts about this book aside until this May. 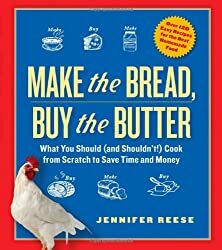 The author set out to try various recipes and evaluate both their difficulty and economics when making at home compared to buying. With each recipe she provides, she offers a small anecdote. The soft cover I bought has no photos, but this is one of those rare cookbooks that has a nice narrative. I like when recipes are interwoven with stories. While I have not made any of the exact recipes in the book, I have done similar ones especially in the baking and jam sections. On the whole, I agree that some things are probably too finicky to do more than once or ever. Reese and I have opposing views about jams and preserves though, but that’s a small complaint. It’s a fun cookbook for those who want to figure out what they should try cooking first. Definitely, make some bread. Finished May 22, 2012 on Kindle. It’s been a bookish week for me. I read finished four books this week: Unnatural Creatures stories selected by Neil Gaiman, Soulless vol. 2 by Gail Carriger and REM, Raven Girl by Audrey Niffenegger, and Wedding Night by Sophie Kinsella (review up tomorrow). I also bought some books. It’s used book sale season! Even though I made a resolution to not buy any more books with one exception, I still had to hit my favourite used book sale yesterday and one last thursday. I went looking for the exception: food and cookbooks. In addition to seemingly collect yarn, pens, and paper, I’ve been building a big cookbook collection the last two years. As well as cookbooks, I was looking for any travel books. This is a food memoirs by an Ethiopian born, Swedish adopted and now American chef. I had not heard about Samuelsson before this memoirs. I think I picked this up because it I read some good things about it as a memoirs about food. The book discusses not only food, but adoption, culture, soccer/football, and many countries including: Ethiopia, Sweden, Switzerland (it made me miss it! ), Austria, New York City, France (I always miss it), time spent on a cruise ship, Ethiopia and more New York. I appreciate any book about travel and observing cultures. The author is a product of that in many ways so it was interesting to see his life over three continents and his journey as a top chef in America. I did like the food moments and learning about little things from each food culture such as Swedish rustic cooking. I wanted to know more about Swedish pickling’s 1-2-3 method (Swedish vinegar, sugar, and water). I also liked the metaphor of fine dining as museum curation. Food as art that after consumed, you would see the world differently. Like some chefs, Samuelsson fell into it after failing at being a football star and he admits he sometimes feels like a failed football more than anything. I don’t know if Gordon Ramsay has said that, but cooking was also his secondary choice after his failed football career. Ramsay is actually mentioned in this book. I have read a few things about Ramsay. I have watched and liked a lot of his British (not American) shows. I even just bought one of his cookbooks during my Boxing Day cookbook spree. I don’t find a lot of his food accessible (too fine, too limiting for my tastes), but I bought the one which had reviews for being accessible. I think he tries too hard with his persona, but I also think it’s somewhat admirable how driven he is about everything. There are a number of British chefs who have worked and been made by Ramsay. Two of the most prominent are women. In a boy’s club such as the restaurant kitchen, female chefs are rare especially those running one of Ramsay’s three star Michelin kitchens. Therefore, Ramsay is mostly in my good books. On the other hand, a lot of people have mentioned what a jerk he is and I don’t mean on TV, but behind the scenes. The jerk American persona is mostly played on his US shows. He has badmouthed a number of people, including the author of this book apparently. He’s allegedly a serial cheater. I also think he is arrogant sometimes, but so are a lot of TV chefs. Reading about how he screamed at Samuelsson and with a racist remark did give me pause. I digressed a bit, but the book does discuss race and ethnicity a number of times. Fine dining is very much a man’s world and sadly, a white man’s world at that. It was intriguing to read in which Samuelsson tried to reach out to the Harlem community, employ women and not tolerate prejudice or abuse from his employees. While the topics of the books were interesting and a couple of times, touching and candid, there was something about this book that I didn’t love. It had moments and I even felt sympathy for the author, but I didn’t fall in love with this book. It is not a must read, but a decent one if you like memoirs and biographies that feature food and chefs. Sadly, I did not read at all this week. Work has been hectic, but it’s my last day this Wednesday. Even though I will miss the income and don’t want to job search, I really need the break from working. Today, I may read a bit, but I have been particularly tired from my weeks. The weather has been dark and gloomy all week. While Sandy didn’t really hit us around here, we got the tail end rain of it. In good news, I baked brownies yesterday. They were a bit too sweet for me, but I used over 10 ounces of chocolate (I had a lot of leftover dark chocolate). 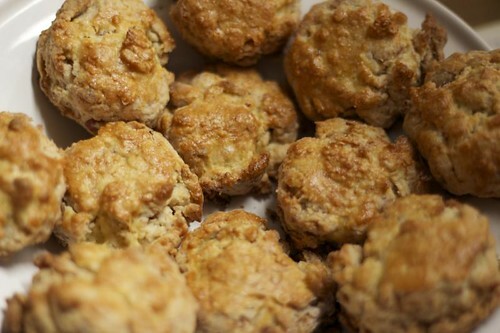 Also very crumbly and buttery. Hmmm. I think I am really a blondies girl at heart. What are you reading and eating this weekend? Cookbook Review: This cookbook was one of three new cookbooks I bought last Boxing Day. I have about eight cookbooks now, seven I got in the past year. Of all these, I’ve used this one the most. The main reason being is that right now, I don’t really cook or bake that much, but in the summer, I did canning, but this book doesn’t just have recipes for canning. First off, this book is good value for money. It has 200 recipes and it’s seasonal based. While this doesn’t always apply since I live in Canada and the author lives in California, the layout of the book does apply to most places i.e. berry recipes follow berry recipes. Additionally, it’s not all just canning, but it includes various clever ways of using leftover or excess fruit such as in the recipe below. The book is a great resource for any novice or seasoned canner, and most of the recipes are from scratch. There are no packets of pectin around here. Some of the canning recipes I liked included: “Strawberry and lemon preserves”, “Blueberry Apple Jam” and “Concord Grape Jelly with Green Apples”. I wasn’t a big fan of her “Do Chau” (pickled carrot and daikon) recipe, but all in all, this book is incredibly useful for the casual and serious canner and cook. There are also recipes on how to use your canned goods (for pies, savoury dishes, etc) and other ideas for preservation like the Lime Frozen Yogurt recipe below. All in all, I recommend this book for canners and those who just like fruit. Garlic Scapes from my little plot. I only grew garlic this year as an experiment. I planted eight plants, but a squirrel took four of the bulbs and one died probably because of the spearmint (which you can see in the background). I picked the scapes a bit late because most people recommend that you harvest them before they loop like I have. Oh well, they still tasted great! This recipe is a good template for pesto in general. I used my frozen basil from last year because I didn’t have enough scapes, but it worked out really well. I just heated it lightly in a dry pan to melt some of the ice. 1. In a small, dry pan set over very low heat, lightly toast the pine nuts, stirring or tossing occasionally until just beginning to brown, about 2-3 minutes. Remove from the heat and let cool for a few minutes. 2. Combine the scapes, pine nuts, lemon juice and zest, salt, and pepper in the bowl of a food processor fitted with the blade attachment. Pulse about 20 times, until fairly well combined. Pour in the olive oil slowly through the feed tube while the motor is running. When the oil is incorporated, transfer the pesto to a bowl and stir in the grated cheese. If you plan to freeze the pesto, wait to add the cheese until after you’ve defrosted it.